There have been a number of developments in the last few weeks which have provided a little more clarity on the situation here in Syria. The first event was the conflict at Jisr al-Shagour in which many Syrian soldiers were killed. After this, the existance of Salafist (and perhaps other) insurrectionists in Syria, intent on destabilising the regime and stirring sectarian tensions/hatreds, cannot be denied. This important and dangerous element in the Syria mix was aptly described by Alistair Crooke in his ‘Unfolding the Syrian Paradox‘ article earlier this month. The killing of security forces continues. Three were buried yesterday, killed in Homs. The second development was the visit of the US and France ambassadors to Hama to ‘support’ the opposition. This visit underlined the point that outsiders have an agenda in destabilising the Assad regime. The US has been funding exiled opposition groups for years, and after 2003 have sought to undermine the regime through sanctions. The ambassadors’ action has simply deepened divisions in an already increasingly divided and angry nation. The third development was the Istanbul conference of exiled opposition figures. Although some 350 turned up, there was little sense of cohesion, and those attending seemed out of touch with the situation on the ground. Most (there are exceptions) have little credibility inside Syria, and no influence on what is happening on the ground. The fourth event was the two-day conference in Damascus involving a number of opposition figures, independents, Baath party members and regime representative. This was a positive undertaking. Unfortunately it seems likely that this was part of the tactic of ‘let’s talk and set up committees to talk about reform’ of the regime, perhaps to buy time while the streets are cleansed of protest. There are grave doubts about the sincerity of the regime while civilians are dying. The fifth observation is that regime has stepped up the organisation of pro-government rallies. On Umayyad Square in Damascus on Monday hundreds of thousands of pro-regime people turned up to celebrate the president and the regime with singing and dancing and a huge fireworks display. This lengthy, televised and gross waste of public funds, at a time when Syrian civilians are dying in the streets, seemed bizarre and out of touch. Giant flags have been deployed to parade in pro-regime territory. As I write this I am watching Syria TV’s coverage of a very large rally in Sueida, between Damascus and Deraa, with a 2.3km flag draped through the city. This is very well organised with helicopters overhead filming the tens of thousands who turned out for the party. Sueida is mainly a Druze and Christian area. I saw very few veiled women attending, and to my relatively uninformed eye, the gathering seemed heavily dominated by these two minorities which fear a Sunni ascendancy in Syria. The sixth and most worrying event has been the deterioration of the situation in Homs, and what has been reported as a sectarian conflict between Alawis and Sunnis, taking the lives of 30 or so people. The further killing of perhaps up to 16 civilians at the funerals of 10 people near the Khaled ibn Waleed mosque further adds to the tensions there. Who did the funeral killings? YouTube footage provides no evidence. Salafists? Alawi Shabiha? Regime security forces? Who knows? So where does this leave Syria? We may now be observing the beginning of a slow gradual process of a complete breakdown in Syrian society – an internal disintegration. I doubt that the regime can retrieve the situation – they have lost control of the situation of the streets – the armed gangs, including Salafists, are showing a determined ability to embarrass regime forces at will. Ineptitude, poor discipline and fragmentation in the security forces has resulted in the growing number of civilian deaths. The regime cannot protect its citizens. Every week this situation goes on, Assad loses respect, particularly on the part of his Sunni support. And every week, the sectarian divisions deepen. The army is coming under severe pressure – how long can it sustain current regime policy? The only way I believe that Bashar can retrieve the situation is to announce a clear process of governmental reform culminating in elections in say 8 months time. This should include a rewrite of the constitution. He should call in the UN to assist in the electoral process, and call on friends like Brazil, Turkey and South Africa to provide assistance (through the UN) in formulating a new constitution. Bashar needs to gain the confidence of the protest movement very quickly to stop the rot. Only by convincing protesters to stay off the streets for a time will the Salafist insurrectionist threat be exposed and dealt with. The protest movement is currently providing cover for the armed gangs to stir sectarian conflict Iraq-style. If the situation continues to drift – then I fear for the future of all Syrians. Kilometres-long flags and fireworks just won’t do the trick. Mr ElBaradei got 25 per cent of the votes cast by the 267,000 participants. 95% of the votes cast for el baradei were cast at langley and foggy bottom. interesting though Syria cannot be compared to Egypt and even less to Yemen. If a referendum for the president to stay or leave (YES/NO) was to be held in Syria within a few weeks, what would be the results according to you ? i do not think that Bashar is supported by the Elite, I do not think they have an important decision, it is the army, which is made mostly from common syrian people, with average assets and income,probably less than 15000 lira monthly income. Most of the army are from common syrian people,the majority are not part of the 4th brigade, and they are not from the republican guards,they are the one who,Bashar must be afraid of, that is why Albukamal is very critical to the regime. Bashar will not come up with any reform that is meaningful,there will be time when he will regret what he is doing now, and he will give promises, promises that will be discounted by the people,promises are indications of weakness,then. I just hope that president Assad does not misunderstand the support he is getting and do nothing , the time to act is now and the time for complacency is gone, Now with people behind him or in front of him the old guard that are worry can not and should not be able to stand in his way. I am shaking all over. If you can excuse what the American occupier did to the Iraqis in Abu Ghraib, you can defend this horrific Mafia in Damascus and their affiliates. Stripping men, leaving them only with their underwear, leashed, dragged and cursed. Is this how nationalists behave? The Assad hegemony must end, they are the embodiment of Satan- the greater and the smaller. They’ve reached the point of no return. This wicked junior is worse than Saddam and Qaddafi combined. Is he putting Syrians in a situation were they will ask for foreign help? Traitors, criminals, I wish words can come to my rescue in describing their barbarism, together with those in their circle. I have the utmost disrespect to Muallem, he is as criminal as they are. This brutality must end. With every passing day, the news of torturing our fellow brethren, openly, is unacceptable. It is time to unite against this regime, because their actions against their own people, is obvious by now. They can tolerate only cheap and docile citizens. We are not. We want to reclaim our country free of these savages. Funny, I didn’t see purple fingers in that part of DC today. The pro-regime biases of the author make it difficult to take his arguments seriously. Since he is a diplomat maybe he should spend the time to read up on Henry Morgenthau, Sr.
Morgenthau was the US Ambassador to the Ottoman Empire during the First World War. While Ambassador he became aware of the atrocities of the Armenian minority and began to speak out against it. He even traveled to Diyarbakir (near the Syria Border) and personally intervened to save the lives of tens of thousands of Turkish Christians. The actions of the US and French ambassadors and there travels to Homs is no different. 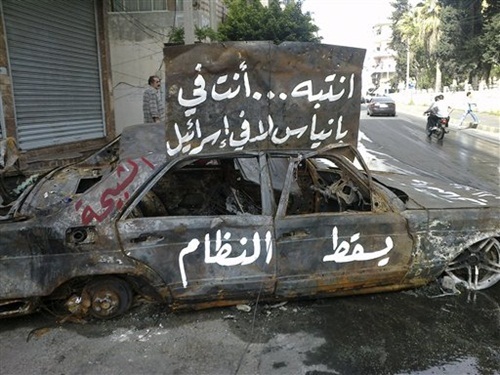 This photograph at the entrance of Banias was previously published in Syria Comment. It looks in fact as a Photoshop fake! The thin (metal?) panel above the car cannot stand by itself without supports. The inscriptions below should normally be as deformed as the surface is, even if they are more recent than the burned car. Who might be the forger Joshua? Exactly. Add to that poor training. This is why the security thugs were shooting to kill. They didn’t know better. This is why detainees are systematically tortured in the most horrible way. Just like Ab Ghreib and Guantanamo. Blame it on poor training. Does the picture of prayers in Homs during the demonstration above “scares” you? Just curious. Regime / ” stability” supporters, please feel free to answer too. What scares me not men praying, but men screaming while their leader is laughing, hysterically. Poor, poor Rami Makhlouf. I guess his pact with the devil about maintaining Israel’s security hasn’t done him much good. While things are bad in Syria, Israel continues the evil behaviour, confiscating ships that are going to help people in Gaza, but I know for sure that Israel will apologize to Turkey for the attack on Marmara ship, that the Israeli caused the death of nine turkish people,Turkish are proud people, and they will force the apology,Israel made a mistake,when they humiliated the turkish ambassedor,and Israel made mistake in killing turkish people, it will take another year, but Israel must apologize and compensate. I detect that you are disappointed,I know for sure that you are very patriotic person,and you believe in democracy, you mentioned several time your admiration to the american system, me too, I like the american system, but there has to be some changes that fit Syria,we have to have a council with power and teeth, that must protect the different minorities,compromise is the clue,and the future will be better.God bless those who sacrificed their life and blood, they are the torch for better future. Why do Moslems feel they have the right to take over public streets (they do it in Europe too) to do their praying, but will never allow others to display their faith (or lack of it) in public? Just imagine the reaction of Moslems if Christians did their sermons in public, or if atheist held a rally in honor of Darwin …. Majed @17 Wow, talk about comparing apples to alien-cosmic-fossilized-oranges. This was the first time ever Homsis had ever managed to carry out a demonstration in the main square. It was peaceful, organized, and without incident. People prayed there as a sign of their peaceful intentions. Of course, you would focus only on the thing that you fear most, namely that of Muslims praying. You blithely ignore what the regime did that night; opening fire without provocation on the demonstrators, with snipers gunning down people who ran through the streets. Videos of the shabiha scum celebrating at the square are abundant on the Internet. Certain people wouldn’t mind people bending over in the street if it were to kiss junior’s picture. I find it interesting that the menhebakites haven’t dared broach the subject of the desertions at Abu Kamal. Baathists only like easy topics, such as “if the flag is 2.4 km, then doesn’t that prove that Besho has the support of 99% of Syrians?”. The desertions, and the regime’s inability to paint it as a Jisr Al Shoghour-type Salafi take over, should have even the most ardent mehebakites scratching their heads and wondering if, after all, junior fed them a pile of BS. Nah, let’s talk about people praying in the streets and some dude on Youtube on a horse. In other news, the regime has released the prominent activist Ali Abdullah. Good, only 13,999 more prisoners of conscious to go. This is what the makhloufian asadian regime did fabricate in Jisr,They presented it as proof of their favorite scenario. Ila mazbalet el tarikh ! Shami @ 19 I love what they called it in the comments section; a Hindi movie. I’d be interested in getting the opinions of the eagle eyed menhebakites. You know, the ones who like to count the number of hijabs in a crowd and thus deduce the exact probability that the revolution is being run by Ben Laden’s cousin. Does this seem remotely believable to you? Only to Al-Dunya and its audience of fanatic Besho lovers. Jamal Tahhan an intellectual and a notable figure in Aleppo is arrested. So boarding a ship is “evil”, but killing over 1000 people asking for free speech is just “bad”. Israel has not apologized as far as I know, and I don’t think Israel has any cause to apologize. Israel is conducting a legal blockade on a terrortory currently at war with her. Moreover, the death occurred because the IDF was attacked and they were defending themselves. Defending one’s life is not a mistake. Israelis are just as proud as Turks. If Turkey wants to send more “aid” ships so break a legal blockade, they can try. Currently much aid goes through over land, but don’t be surprised if someone else gets hurt if they break the blockade. The recent boat from France ended quickly and peacefully, because the IDF was not attacked with pipes and knives. … it will take another year, but Israel must apologize and compensate. Will you ever guess what city ? Compare the graffiti on the wall, the you tube, to the one sprayed on the x ambassador’s car, and the Muslims praying in the square. The picture he or Prof. Joshua choose to post. A factual reminder, the majority of Syrians are religious and conservative. thousands of Turkish Christians ? what do you call “turkish christians” ? how many turkish Armenians were butchered ? how many Assyrians were slaughtered raped and burnt ? how many oriental Greeks were expelled from Turkey ? The problem with Bashar is, he has very limited people skills. Also, he has no stage presence. Which is why you hardly ever see him or hear him. Dictators live in the shadows, behind the scenes. Yes, to keep his throne, he needs to announce a clear governmental reform. But he also needs to get out front and be seen leading it and acting as a “first citizen,” if you will. But he is incapable of this. He’s a sad little eye doctor who, by quirk of fate, became an accidental dictator. The Syrian people should promise him a lifetime medical practice on the conditions that (1) he step down and (2) his silly wife and his children leave the country and never return. Israel sent troops with machineguns,bombs ,to international water,and the turkish had only wooden rods, and you dare to say they attacked Israel?enough lies. Kill a Hamwi singer, and a dozen take his place. I am almost certain now that Bashar is not in charge. Calling for his resignation ignores the fact that he does not matter much anymore. He was supposed to speak on TV today but that was mysteriously postponed according to an “official source”. I have to make it clear that I was not holding my breath for Bashar 4th speech but I wanted to hear the magical words from him on article-8 and the other legitimate demands because hearing that from the head of the regime still carries a symbolic significance.Syria as of today does not have a president,like it or not. Abughassan @27 That’s because events have overtaken whatever speech his speech writers had prepared for him. He’ll need another week to get a new speech ready, by which time things will have spiraled out of control yet again. Junior was never in control of anything. Every shabiha in Homs thinks he’s a law unto himself, with tragic consequences for the residents of Al-Hadara. Till this very moment, people in different parts of Homs are demonstrating, while the residents of Al-Hadara don’t even dare look out their windows…that’s if they have stayed in Homs at all. You are wasting your time trying to argue with PALACE. The Gaza blockade is illegal while he insists that it is legal. Palestinians in Gaza should be able to have access into and out of Gaza through their own ports, airports and overland crossings. Goods coming into and leaving from Gaza shouldn’t be subject to Israel’s approval. International visitors should be able to enter Gaza in accordance with the Palestinian Authority’s approval and not Israel’s interference and illegal blockade. Don’t waste your time and arguments with PALACE. You know that you are right. You don’t need to convince him. He has his own agenda. Who do you think then in control? Maher and cousins? Bushra and hubby? Has he ever held the power? If we are not dealing with one person, then it is more indication that only pseudo- reform can be expected? Can a mafia clan reform itself? It scares me as little as people flogging on Ashura or christians praying in the Vatican, or hindous in the Gange. In the contrary peaceful manifestation of fervor to God in prayer or mourning is very moving. Manifestations outside prayers scares me, and I can stand people using the name of God in politic, war or fights or any sorts, as if they are sure God is on their side. For me this is a sacrilege. I am all for freedom of questioning but when same questions get brought up again and again, then you know there is no other motive and answering it becomes a waste of time. Do you think Bashar is in charge? Does the like and dislike buttons work for your own comment? It is not working for me. I get the red dislike button already clicked by someone even before I send my comment. I just want to take a preemptive measure…. Why did you removed my last comment?this site is a joke,and the freedom of ideas here is almost like Saudi Arabia,I am very disappointed .you remove a comment which has no single insult . MB crowd and supporters you have cleaned up one more infidel,congratulation,keep going and remember that:الجنه تحت ظلال السيوف,of course the swords here means flowers and olive branches. You are not alone in believing Bashar is EVIL and Fidaa is the Exorcist (he does look like one). If not Bashar, then it’s the army. I have noticed that it is tabou to criticize it. Opposition Syrians seem to see it as the future savior of the nation when it is so obvious that the army (with its young sunnis troops and its alawite officers, is it true?) still side with the ‘regime’. I guess they want to hang on something to hope for when Bashar leaves. But when you see what the army is doing in Egypt, they’ll be just switching to a new, more powerful and organized mafia! If Syrian opposition wants a military regime, probably harder to dislodge than the Baath party, they’ll get it, if Bashar goes. b. Israel does not need to apologize for her actions. Feel free to Google the UN report. Maybe if Israel killed over 1000 peacefully protesting Syrians instead of 9 violent “peace activists”, you’ll move her from “evil” to just “bad”. Another example of The Double Standard. When you have a constitution that separates religion and state while it guarantees freedom of religion, such as in the USA, then whoever has an Islam-phobia, Sunni-phobia, Alawi-phobia, Shia-phobia, Maronite-phobia, Protestant-phobia, Catholic-phobia, Clustro-phobia and any other phobia will have to seek help for their phobia or deal with it, without any impact on the matters of state, laws and the conduct of the government. So rather than you focus on who is friendly to your religious feelings, focus on how to agree on a constitution that will keep religion, religious preferences and biases out of state civil laws and government conduct. Islam phobia is an outcome, not a cause. The question we should be asking ourselves is: what is it that Moslems are doing to cause such fear among non-Moslems, and even moderate Moslems. We may choose to pretend to be a religion of peace and tolerance and quote select verses from the Quran to prove it, but our conduct is filled with aggression and intolerance, not to mention overwhelming prejudice against those who choose not to believe in Islam. The blame lies solely within us for disrespecting others and being loudly demonstrative about it, both verbally and visually. It is just shame that dictatorship has been the fate of the Arabs across the ME, what is that about? Why only the Arabs? Does our culture and heritage play a role in the personality cult? If not, why the Arabs? I have just watched one of the most disturbing videos since the beginning of this revolution. It is labelled as likely in Homs, but where it was taken isn’t the problem here, it is that it happened to begin with. After the victim was slaughtered, he was dragged around by his head using a crowbar. It is just as disturbing, if not more that the public hanging in Hama. I cannot believe people just stood there and watched this horrific and barbaric act. The spectators are just as criminal as the killer and should be held accountable. The Syria army is an ideological army and after what happened to the Baath party and the Iraqi army of Iraq, I see no chance for the Syrian Baath party or army of giving up under the gun and the violence of the opposition , It just will not happen, only peaceful reform and election and the guarantees of changing power when a party loses is the only way to move forward, I said it before and i say again, The opposition should declare victory and line up behind the president to cancel article 8 and have free election, the question are they smart enough to see that nobody is comming to their rescue. FYI, I am All for secular constitution and complete separation of the state and religion. I could not care less if people are friendly or un-friendly to what I believe in. It really is their business. It would not add or subtract to anything. I was just stating an opinion. intolerance does not reason. While I myself a Salafi- phobic, I disagree with the inclusion of moderate Muslim in your statements. It happens only in hot climat countries.. funny, no? Bashar was accused to hang on to power at the cost of destroying the country. This is exactly what the foreign-commanded opposition is doing, putting their interests and their desire of power (and revenge) in front of the country’s interests. Their attitude is as despicable as the ‘regime’ they accuse. If I had some admiration for the courage of the opposition at the beginning, I have none now because I think they got the same disease they are supposed to fight against. “but where it was taken isn’t the problem here,” absolutely right. I agree with every word you said. It is depressing. The imagery will hunt me for a long time. My only hope that it is fake. People with such minds must be brought to justice and punished accordingly. Someone with this kind of savagery is a threat even to his loved ones. You forgot my name now? Look at post 42. Why would colonialism, religious restriction, and lack of women education lead to dictatorship? With a syrian passport, you don’s need a visa to go to Iran. If you want to go with an US passport then be prepare yourself to wait but not as long as an Iranian needs to wait to get a US visa. Iranian travel agencies in the US can arrange visa too. It is a complicated subject to develop here, but there are a lot of books written in the subject: How and where authoritarian regimes and dictatorship emerge and persist. It seems that the Alawit neighbourhoods, finally, decided to concatenate their efforts and join their own Syrian fellows in order to throw “Bashar” away, however, to be replaced by his little brother “Maher”. Believing that Bashar is not able (capable) enough to protect his sect, pictures of “Maher” are displayed all over Homes and Damascus in crowded Alawit neighbourhoods. An action brings memories from 1984 when the uncle “Refaet” has challenged the father “Hafez” and started lobbying the Sunni elites and merchants offering himself as the ideal saviour. This is a classic psychological reaction of uncertainty and emotionally driven decisions rather using the logic of (pros Vs Cons) to opt a suitable replacement for the state not only for a sect. Firstly, will the group of Menhebakites, automatically, change their love and loyalty to “Maher” and forget about “Bashar”? Secondly, how will “Maher” deal with his brother “Bashar”? that was some horrific footage. it’s not obvious however where it was filmed. Agree the crowd are as criminal. This is the worst footage I have seen. It is so horrifying to imagine that this was made in Syria. Nothing can justify a crime like this. I don’t think so but I don’t really know. I watched only few frames after I turned the volume off as I can’t tolerate combined visual and auditory effects at the same time. I am not the kind of person who can watch things like that. I can ‘t even watch horror or suspense movies. I read you link about the royal family. This world is a horrible place. He can be asian and we still love him! Fair enough, but would you like me to link you the many, many other songs that singers have done in SUPPORT of Bashar al Assad? What is funny is how the criminals who are protesting and destroy property and harm people are praying before they protest. Honestlty, nothing good comes out of doing bad things in the name of GOD. So, they will got no where. Bashar will prevail. Aboud, menhebu la Bashar, menhebu kteeerrrrr! This is a beautiful song! Meanwhile, Israel and Turkey have not yet agreed on the report of the UN panel, which Ankara, on legal grounds, insists should not contradict with the findings of a previously released UN Human Rights Council report. The UN Human Rights Council said in 2010 that Israel’s military broke international laws during the raid. The report said Israel used excessive force, but implied Israel used “its legal right to impose a naval blockade against the Gaza Strip,” a finding which could pave the way for further interventions by Israel in the Mediterranean Sea, Turkish officials said. There is diference between blockade on Gaza,and attacking ship in international water, knowing very well that it has turkish people, and there is no weapons on it.further they used weapons while those on the ship has no weapons. Wars and violent conflicts bring the worst in people, this is why it is better to avoid them when possible. It seems that all the minorities are leaving SC I wonder why? قال رسول الله:الجنه تحت ظلال السيوف of course what he means is under flowers and branch of olive trees.now Tara خانم will say why are you islamophobic?the answer is simple because this is terrorism,plain. I’m sorry that you linked this horrific clip, it’s not in Syria, it’s in Lebanon of an Egyptian guy. I don’t understand why people share such graphic images, it’s so disturbing, they have no point whatsoever, they trigger violence and support revenge, it’s wrong to distribute them. I am waiting for you to remove my last comment like you did with the one befor,try to apply for a position at :إدارة الامر بالمعروف والنهي عن المنكر in Saudi Arabia .when MB posters complain to you about a post you use your own judgement and you don’t become a hostage to them. I need to apologize from all of you for my rude comment yesterday (Thank you MDS) I didn’t mean it the way you explain it but you are right, it was unfair and ‘weird’. My anger came from the fact that it became an unhealthy trend between Syrians lately that if my opinion are not 100% similar to yours, I’ll be either get ‘unfriended’,’blocked’ or ignored as if democracy meant that we have to talk to only people who we are similar in opinion with and avoid anybody else, that is the worst message Syrians are giving for each others. It’s healthy if we have differences because it makes our dialogue richer and more constructive than talking with the same tone all the time, otherwise we become rigid and close minded and we deserve one party to rule us, isn’t the whole movement is to avoid exactly that! I know that you are smart enough to know all this but I wanted to explain myself so you understand my reaction better. I too will always respect you and your opinion “No matter where you head”. Agree fully with your comment to SYAU. Images only inflame. And thanks for the nice comment that followed. I really can not ask anyone to agree with me 100% because in these situations none of us can even agree with ones own opinion of yesterday. The two of us are managing to do something that is hard to do nowadays even within families. We are keeping the deeper understanding we have of each others to give us the tools to understand why each takes whatever position we take and to maintain not only cordial relationship but even to support each other despite of our differences. Now this is something I value, and I am not ready to give up. Thanks for that, if you say it didn’t happen in Syria, then I trust your opinion. Not that it makes it less horrific, but I’m relieved that you say it’s didn’t happen in Syria, and that Syrians would not be capable of such horrific behaviour and others would just stand there and witness it and not do anything. I linked it because I have been so disturbed with the images I have seen over the passed four months, especially of the public hanging, the murders and mutilations and burned corpses of the soldiers, it was just too much and set me off. I will refrain from linking such graphic images in future. Apparently it was retrieved from one of the pro revolution webpages. Ford’s visit was to Hama not to Homs , it was NOT innocent, disagree that it has ” prevented” a massacre in Hama . The crises in Hama was delt with tactfulness with no force used, it should be an example to follow in all of the cities. A lot of bargaining is happening , the regional and outside brokers are fervently negotiating , USA just like all of the other power thirsty states want a piece of the action, that is why Robert Ford went into Assi Square in Hama. We are not far at all from seeing Syria with political parties , and america wants it’s political party installed . I totally understand your feeling, sometimes it’s unbearable. Jr is frantically intensifying his dialogue activities. His teams are reaching out to activists all over the country. Their compelling messages and silky style have persuaded scores of activists to leave their homes for the dungeons of Mukhabarat. I pray that some day, God would excise justice from Jr, every member of his teams and everyone who care more about national unity than about the suffering of these people and their families and children. The hell with the national unity if it is going to be built on torture and human skeltons. كما هو معهود من نظام بشار الأسد الأمني الذي جعل من سوريا سجنا كبيرا للأحرار,حيث إنطلقت منذ ليلة امس وحتى اليوم حملة إعتقالات شرسة في معظم أنحاء سورية. ففي حلب الشهباء اعتقل امس الكادر القيادي في الحزب اليكيتي الكردي (ويس عثمان شيخي) المعروف ب ويس اوسي على خلفية مشاركاته في المظاهرات بعد استدعائة صباحا إلى فرع الامن الجوي وهو من مواليد كوباني(عين العرب) لعام 1966 متزوج و أب لستة أولاد. هذا ولم تسلم المدينة الجامعية في حلب من حملة الإعتقالات حيث اعتقل كل من : علاء عبد المولى حسن الزعبي ، حسام نذير مصطفى الزعبي و مازن محمد الزعبي (من أبناء قرية المسيفرة في حوران). خليل ابراهيم المرعي والذي لم يتجاوز عمرة الخامسة عشر. ولم تسلم داعل ايظا من هذا الاعتقالات حيث قامت عناصر المخابرات باعتقال السيد:رياض موسى قطليش قبل يومين. اما في نوى المحاصرة، فقد اقتحمت القوى الأمنية منازل المواطينين الآمنين في مدينة نوى الصامدة و ارعبوا الأطفال و اعتقلوا أكثر من 20 شاب من شباب المدينة على خلفية مظاهرات ليلة أمس . وأما في قرية المليحة الغربية التابعة لحوران فقد قامت عناصر من المخابرات السورية فجر اليوم بتوقيت الساعة السادسة صباحا باقتحام قرية المليحة الغربية و اعتقلت عدد من الشباب وهنا نورد لكم ما توصلنا إليه من أسماء للمعتقلين هناك :للمرة الثانية منذ إنطلاق الإحتجاجات في سوريا الاستاذ الحاج محمد الحراكي (ابو خلدون) وابنه ادهم محمد الحراكي (ابو غيث). وأما في ريف دمشق فقد قامت قوى من الأمن السوري والمخابرات بشن حملة اعتقالات عشوائية في عدة مناطق من قطنا ودوما وداريا ومعضمية الشام وباقي مناطق ريف دمشق. ففي قطنا استطعنا عبر مصادرنا التأكد من نبأ اعتقال السيد جورج صبرا من منزله دون السماح لة بإرتداء ملابسه مساء الأمس. “Jr is frantically intensifying his dialogue activities. How do you know this to be the case? Is it reported somewhere? Apparently government sources have denied any immediate amendment to Article 8 of the Constitution by the President, who does not have the legal power to do so of his own accord. Kandahar, texts are just texts. You read them, you may or may not understand them or their contexts, and then you apply to your life what you agree with. Do you really really think that Sunni women agree to be beaten or left out to ” sleep on the floor” because there is a text in the Qur’an about that. If you really think so, then you probably do not know us women… Domestic abuse is not more prevalent in Sunni Islam compared to other sects and religions. It is simply not related to religion. Moreover, and this might not be related personally to you, phobias are phobias and sometimes they are not reasonable. I personally am cat-phobic. ( if I am ever caught by a mukhabarat, They can just get a cat in the room, and I would admit I am OBL). I was never “attacked” by a cat. Cats are not evil creatures. Cats can not do anything to make me less phobic. Now, this is obviously a naive simplistic answer to Islamophobia. The atrocities committed by Islamic terrorists and the misplaced use of Shariaa law in differrent parts of the world (as we learned on SC) are probably playing a role in this but at the same time, I want to say learning about the Crusade and the inquisition should not be a good enough reason to make me christianophobic. Thanks for taking the time to search the investigation. Yes, naval blockades can be “legal”; Israel wouldn’t be the first country in the world to use one. Anyway, I just want you to know my take on this (flotilla) issue, since YOU brought it up yesterday out of nowhere. This whole flotilla issue, IMHO, it just another example of how many Arabs and Muslims are so biased and hateful against Israel that they lose all perspective. The investigations and money spent on this incident took valuable resources from the UN (Human Rights Council along with Geoffrey Palmer’s investigation) as well as from the GOI. It is clear by any objective observer, that the passengers beat the crap out of some IDF soldiers and that 3 IDF were seriously wounded. The IDF responded to protect their lives. It is also clear that a large element of the flotilla passengers were not “peace activists”, they were jihadists who were PLANNING for a violent confrontation. My point is, your obsession with being anti-Israel causes you to focus on an “evil” Israeli crime where 9 “peace activists” were killed, but prohibits you from treating a much worse situation, namely the murder of over 1000 unarmed Syrian protestors, in a worse light. In fact yesterday, you called the situation in Syria “bad”. One can see from your use of language how biased you are. In light of over 1000 MURDERS of Syrian demonstrators by the Syrian government, do you think 2 UN investigations are warranted in this case, just like the ones used to investigate the Turkish flotilla? Yes or no? It’s time to make religions (all of them) what they are. Ridiculous. The way to do it, is by ridiculing them with no fear. I don’t think that Kandahar needs to apologize. This is his unique style which I like a lot. I’m against censorships of all kind. His comment was intended on delivering a message in a funny and harmless way. I’m sure he didn’t mean to insult. Do I understand national unity is based on the courage and success of Khalid Ben Walid in the spread of Islam with the sword? Very peaceful and secular indeed? DAMASCUS- In a dialogue symposium under the title “Reform Process…Political, Religious and Legal Vision” at Damascus University, Foreign and Expatriates Minister Walid al-Moallem on Wednesday said the new political life in Syria demands new parties to be formed with a political, economic and social program so that each citizen can join whatever party he chooses. Foreign and Expatriates Minister al-Moallem referred to the currently prepared new information law which will provide press space for to-be-formed parties. He also pointed out to the new elections law taking, into consideration that the new parties will compete in the elections for the coming parliamentary term. …. To prove you’re a person (not a spam script), type the security word shown in the picture. Click on the picture to hear an audio file of the word. 1//the security word is:you all oppos”bozos”go back to your falafal stand and do me a favor hold the Tahina sauce. 2//Click on the picture to hear an audio file of the word. I clicked and heard ALLAH AKBARRRRRR THEN KABOOMMMMMMMMMMMMMMM…………band aid anyone? Because Muslims believe they are on the right path. Does the Israeli government allow anybody to talk about how the Palestinians were forcibly expelled from Palestine in their state media? Can somebody be given a platform to criticise the gay movement in the American media? Are the Arab Christians going to allow gay marriages or gay pride parades in their churches and neighbourhoods like the Western Christians? Let them enjoy their exile in the secular paradise of Iran. If those who are using secularsim as a side issue to deflect from the crimes of the regime, then go preach secularism to your allies in Iran, Iraq and Hezbollah. You say the minorities in the Middle East should be wary because they were oppressed by the Muslims and I agree with you, even though I don’t sypmathise with these groups and every group acts in its own interest. So why does the menhebek crowd refuse to acknowledge that many Syrian Sunnis hate the Alawi regime because it slaughtered, jailed, tortured tens of thousands of their brothers. When are you and your fellow Zionists going to leave the land you stole from the Palestinians. Asad army units are searching and destroying old neighbourhoods of Homs. Over 90% of syrian are musslems,it is not reasonable to exculde party with islamic background, Christians can also form their own party.in politics minorities must be protected. Why are you crying crocodile tears when your government deliberately killed tens of thousands of civilians in Palestine and Lebanon and when it sponsored and backed right-wing regimes which killed thousands with Israeli weapons? Israel is a “democracy”? We’ll see how democratic it is when the Palestinians exceed the Jews in population which they already have. Its ironic you’re attacking the Syrian regime when both of you face the same fate: exile. You and your ilk better start packing your bags. No land was stolen from No Palestinians. This is a Jewish land belongs to the Jewish people and nation. Alway was always will be. If you don’t like it, go and drink from the sea of Gaza. Second: More martyrs fell as a result of the funeral massacre perpetrated by regime forces. Third: Many citizens have been arrested, including three specialist doctors and five nurses. We ‘menhebak crowd’, personally i prefer Assadian, but we do consider the thousands of your Sunnis that were killed. And when we consider them, we also consider the thousads and thousands of Alawis that the Sunnis killed. We consider how an Alawite could not step out of his house with his head held high, for fear of being recognised as an Alawi, which would ultimately mean his life would end. And brutally. We consider how many innocent Alawis the Sunnis killed, for no other reason than they were Alawi. We remember the times when Alawi men and women were murdered, because the Sunnis called them “shafet 3alawi”. We rememer when women were raped, because they were not vield. We consider the thousands of Alawis that were chopped into pieces. We remember the Alawis that were skinned alive, while their skinners would deliberate on what would be the slowest and most painful way to skin them. We remember how an Alawi would fear walking though a village full of Sunnis, because his or her brother never returned taking that same road. We remember the torture, the pain, the missery. So when you think of your people, think of what they DID, and then mourn them. We love Bashar and we love Maher. The ones on here who think that Maher will take over, good. Another Assad. Then, lets hope it will be Hafez Abu Bashar. Menhebon. Why are you crying crocodile tears when your government deliberately killed tens of thousands of civilians in Palestine and Lebanon and when it sponsored and backed right-wing regimes which killed thousands with Israeli weapons? You’ll have to trust me; I’m not crying. I am just pointing out the hypocrisy many in the Arab world (and on this forum) have when it comes to Israel. Hypocrisy may not even be the best word; perhaps “bias” would be better. When it comes to Israel, a different standard enters the discussion. Why? Why do Arabs and Muslims judge Israel with a different set of criteria? I understand your hate of Israel. Israel has killed Arabs. Some of them innocent by-standers. I could go into a defense of Israel, but I won’t. Look at the italicized quote I copied and pasted on the top of this post. Can you link us to a similar outburst here on SC where you made the same accusations against the Syrian government? If all citizens (Arab and Jew) can vote in local and national elections, why wouldn’t Israel be considered a democracy? Can Syrians vote? Why aren’t you questioning Syria’s political make-up? We’ll see how democratic it is when the Palestinians exceed the Jews in population which they already have. It wouldn’t pain me at all to have a majority Arab population in Israel. If Jews were only, say, 49% of the population, they would still have substantial political power in a DEMOCRACY, just like the 20% of Israeli-Arab do now. Arabs make up a significant percent of the Knesset, arabic and english are official languages of the state along with hebrew. Its ironic you’re attacking the Syrian regime when both of you face the same fate: exile. It isn’t just me that is attacking the Syrian regime, it is the Syrian people, who are dying just by speaking out. Why aren’t you “attacking the Syrian regime”, haven’t the Syrians killed more Syrians than Israel? You and your ilk better start packing your bags. The regime is weary of its loosening grip on power in Homs city. Its collapse in Homs would mean that it could no longer guarantee the protection of its loyal shabbe7a and security forces, thousands of whom take residence in a couple of its neighbourhoods. Such would send a signal to the shbee7a and security forces across the country to jump the drowning ship. Mr Ford’s charm has held nicely in 7ama city. This post aligns with the regimes new strategy, thus the regime is the likely source of this “impartial” view. Impartial views that are camouflaged in text that talks from a third person point of view and offers suggestions that align with the government’s plan to appease (and swindle) the nation. Can anyone provide any evidence regarding who killed whom in Jisr al-Shaghour? All we have seen is the ends but not the means. These claims are getting tired. I will with an open mind evaluate any clear evidence substantiating the claims. n.z. appears to stand for neocon zionist which is redundant but that seems to be the point – n.z. is an extreme zionist. much exaggeration, fabrication, nonsense, again from our pet zionists, chalabi-maliki-abbas supporters, and earnest but deluded syrians, who keep the lies flowing re the syrian govt and alleged happenings. I thought you said you were anti-religious, so are you going to tell me God gave this land? And I can guarantee you that the majority of today’s Israelis aren’t descended from the original Judeans. And, no Israel is finished just like the Mexicans have taken over California through demographics, the Palestinians will take over their lands which was stolen from them. Go back to Russia and Poland, your ancestral homeland. I oppose massacres and indiscriminate killings but are you saying that the majority of Sunnis killed in Lebanon and Syria killed Alawis? Even from those currently protesting? Yes or no? I’m against the Syrian regime so many of your words don’t apply to me and yes, it is natural to hate the outsider more than one’s own group. Israel is hated because it is the other. All groups are guilty of this, even the Jews. Thank you for being honest and I understand why the Jews took over Palestine. It was an ingenious plan and they pulled it off, even though I personally hate it and will oppose it for the rest of my life. But if you really understand my hate of Israel, then why do so many Jews deny this reality, especially in their propaganda directed at the Jewish layman and gullible goyim. Don’t expect to take over our land and expel our people, then expect us to smile at you. Yes I have, and both governments are doomed because of demographics. The Palestinians in 48 will take over the Jews in two decades and there is already is a surplus of Palestinians in all of Palestinians. This is why your government imported many Russians who aren’t proper Jews, some even Christian, to stave this off. The clock is ticking and time isn’t on your side. I have attacked the Syrian regime and yes you are a major hypocrite. I didn’t see any Israelis condemn the massacres committed by their favorite Arab dictator, King Hussein, against the Palestinians. Your just here to brighten Israel’s image as the so-called democracy, when the Israeli government is drenched in blood and supported some of the worst regimes in the world to oppress their own people. So much for democracy. Your ilk are finished in Palestine just like the apartheid regime and its supporters lost. You can make aliyah to Poland. You can make aliyah to Poland. Moving down to your last sentence, I see there is no use in further dialogue. Israel is growing stronger every day: economically, socially and politically. That is probably the reason why Arabs living in Israel are not demonstrating like they are in the rest of the ME. You seen no use in further dialogue because you were exposed for your hypocrisy. Go shed your crocodile tears somewhere else. Your pathetic jokes can’t erase what you did to the Palestinians and how you expelled my people from their land. Israel is finished and most geostrategists agree with this. Why are you ranting about democracy when your government supported some of the worst dictators in the world? MOSCOW- Russian President Dmitry Medvedev on Tuesday said his country stands against all steps of the international community that could result in pushing the events in Syria in the manner of the Libyan scenario. “For this particular reason Russia has adopted a very reserved stance at the Security Council with regard to Syria,” Medvedev added in a joint press conference with German Chancellor Angela Merkel. The Russian President stressed he does not want to see an international resolution that might be later manipulated and used to control the skies over Syria in order later to start military operations and the like. EU and U.S. slam Syria at U.N.
Medvedev was very clear when he said in a recent interview with the British Financial Times, published by the Kremlin, that Russia will use the Veto against any Security Council resolution on Syria. Start packing your bags menhebek lunatics as many tribes will be coming. And this, just in time for the Moslem holy day. That’s another thing about Bashar’s management skills: his sense of timing, as another Friday is almost upon us. The Assad Mafia must go! Not all. But yes. In lebanon why do you think it all started between Jabal Mehsen and bab al tebeni? Isnt it because an alawi was going to report the neusance of the Sunni crowds in their town? Was it not then that he was shot in the head? In Syria. The Alawi men that were mutilaed. The men that were chopped up and sent to their families. Was it not then that problems arose in Homs? Back in the day when the hostility was paramount, many Alawis suffered at the hands of Sunnis. And naturally they had revenge. And it looks like the Sunnis are not mising a chance they get to kill more alawis. Like you i do not condone massacres. They are horrid. But there were faults from both sides you cant blame the Alawis for the opposition. Blame the extrime Sunnis who cant bare to see Alawis in high places. Again, are you saying the majority of Sunnis killed in Lebanon and Syria were personally involved in the killing of Alawis? Some of them yes, but the majority of them? Have you forgotten that many Lebanese Alawis collaborated with the Syrian army in Lebanon including the siege of Tripoli where they engaged in massacres? I’m not denying that Alawis weren’t oppressed or unfairly targetted(during the 80’s) but it is your beloved regime which began with the killing in the recent events. they were non jewish trees. being non jewish they were ipso facto, anti jewish. wait till israel has a say in syrian affairs. all that is non jewish will be bull dozed or set afire or bombed. Don’t you think that this regime should fire its chief strategist? He is either an agent of the revolution under disguise, a disgruntled underpaid employee, or just plain stupid. What is happening in Homs today is going to inflame all of Syria. I expect massive demonstration tomorrow. I think that Ubo Umer is as bad as kaled shiek mohammad,Zarkawai..
if any CIA or someone is iterested he is a dangerous person. Allah promissed!! ?the MB bad boyz 72 virgins for their nasty deeds. This blog has become a stage for Israel-Palestine and Alawi-Sunni pointless and violent bickering, going back 2000 years ago. I got tired of skipping posts. It has been taken over, and not only on Fridays. I am not at ease in wolves den, therefore I am going to a quieter place until they get tired of yelling at each other. I am learning nothing, in the contrary it is putting more doubts in my mind about the quality I thought all Syrians had: Kindness. I prefer to stop here. Then we should have Syria comment I and Syria comment II. One devoted for Arab-Israeli conflict/ Alawi- Sunni quarrel and the second for the current crisis with one admittance condition: being nice. You can not leave like this. You can have a conversation with me and some others. I am kind. I promise.. I understand your feelings, but I have to say that I’ve been learning a lot. – I am learnng that 9 dead “peace activists” who violently attack IDF personnel with lethal force angers the Government of Turkey more than than 1500 dead Syrian protestors and the fleeing of 10000+ Syrians over the border into Turkey. Forget it, Why Discuss can only thrive in environments where he can control the discussion. Do you really think he wants even to attempt to answer difficult questions? He mistakes “kindness” for “agreement” just like the Syrian regime. If you do not agree with them, you are a “bad” person and not “nice”. Sounds familiar? thank you but i’ll not stay here. What do you think about my question to WD ? about the result of this would be referendum ? Apart from this, i have some feeling that this blog is no more managed by Joshua. Something has changed. The comments section is no more what it used to be. Am i wrong ? I disagree. President Assad should do nothing except slow reforms. Civil war will be manageable as long as he has full control of the army and security forces. He does. Iraq’s problem was that US destroyed Iraqi army and its government. Russia and China would not allow US or Europe to destroy the Syrian army. Turkey tried to invade northern Syria and create a Turkish new supported and controlled X Syrian government but so far it failed. Lebanon civil war was also manageable after Syria’s army moved in. I doubt that Turkey and Jordan could do much to fuel Syria’s civil war. They have much to loose. Turkey has many millions of Alawis ready to join the fight to defend their Syrian relatives. Iraqi Shias will be quick to move in to defend their newly gained political, economic, and social equalities in the area. As for the Syrian economy I do not see a big problem since Syria’s economy is mainly Damascus and Aleppo. At the end we will see great migration of families and businesses, as it is happening now, to the two big cities running away from the hot spots. Also, a large percentage of Syria’s economy is supported by the expat community abroad. I have said before that adding up minority support, some Non-Muslim-Brothers Sunni support,… one can conclude that Bashar Assad has more than 50%+1 support. I do not think that he believes he needs 99% supports like someone said on SC before. I do not think that the guy who did not blink against George W. Bush accompanied with 200,000 US solders or against 2006 Israeli war and Israeli threat to destroy Syria or even UN Lebanon-Syria resolutions or Hariri especial court or Hariri’s European connections or, … is going to call it quit during the present light-in-comparisson situation. this is from Haaretz news. What is going on in Homs? الشاب” اكرم خضور” يعمل في توزيع جريدة بلدنا اختفى من مكان عمله صباح السبت 16/7/2011، و كان قد نفي خبر اختطافه من قبل عائلته, و عندما سأل الناس عن السبب و راء تعتيم خبر اختطافه أجابهم الأب بأنه ما يزال يأمل أن يجد ابنه حياً ولا يريد أن يزرع القلق من دون أن يعلم حقيقة ما حل به, وتم العثور على جثته مساء الأحد 17/7/2011 بالقرب من جامع الرفاعي في منطقة حي النازحين ..حيث كانت الجثة مشوهة، نتيجة تعذيب تعرض له تمثل بحرق ولكمات وكدمات . ونقل والده على إثر ذلك إلى المشفى الوطني بعد دخوله بغيبوبة. الشاب ليس شبيح فهو لم يكن في احدى المظاهرات المؤيدة كما يحلو للمغارضين تسمية المؤيدين للدولة بل كان قد انتهى من عمله و مشغول بالتحضير لحفل عرسه بعد اسبوع !! اختطف أكرم بسبب انتمائه الطائفي و اتضح الموقف اكثر مع تكرار حوادث الخطف لابناء احدى الطوائف و العثور على جثثهم لاحقا مقطعين و مشوهين.و التهديدات التي يتعرض لها ابناء طوائف اخرى منذ بداية الاحداث. اليوم و الدم يسيل في حمص بالساطور الطائفي يخرج وجوه المعارضة من مثقفين كـ “فايز سارة “و غيره من ناشطين حقوقين ليقولو ان من سقط من حملة السواطير هم ثوريون او ضحايا بيد الامن السوري بل و ينفون صفة القتل الطائفي و يضعوه في اطار الشبيحة و الامن و المعارضة الضحية ,و يلقون باللوم على الدولة\النظام و يتهمونها بالتحريض الطائفي . فايز سارة و غيره الذين تغاضو منذ البداية عن الشعارات الطائفية التي خرجت في مسيرات الجمعة بعد الصلاة ووصفوها بالافعال الفردية هنا و هناك والقو باللوم على الدولة التي تمنع الاجتماع سوا في الجوامع بل و سخرو من بيان المفكر ” فراس السواح” حين حذر من هكذا هتافات!! و تغاضو عن دعوات الجهاد على منابر مختلفة والتي القو ايضا بلائمتها على عنف الدولة !! كل من يتذكر احداث درعا من اربعة اشهر و هي كانت البدء في موجة الجنون حيث خرجت دعوات الجهاد و هلل لها و ببرها علمانيو و مثقفو الثورة خرج احد شيوخها المعروفين في فيديو على منبر احدا جوامع الثورة الدرعاوية ليكفر الطوائف على المنابر و ينال من شرف نسائها و حينها ايضا جل ما فعله هؤلاء المثقفون و الحقوقيون ان تمسكو ببيان مكتوب على الشبكة الافتراضية بلا توقيع و لا ختم-يكتبه ايا كان ولو في نيويورك- باسم من سمو انفسهم مسؤولي الثورة في درعا يشجب الشيخ -الذي كان قائد منصور -و ينعته بازلام النظام ! علما ان الفيديو الفتنة ينتهي بهتافات مؤمي الشيخ ضد شخص الرئيس و الدولة\ النظام المعروفة بهتافات المعارضة التورجية.. و جل ما فعلو ان القو اللوم على النظام! !و لصق الشيخ بالنظام!! في بانياس حيث كانت ايضا اولى المظاهرات و التي خرجت -و حينها لم يتوقع احد انه سيخرج احد -و اول ما فعلوه ان اتجهو في الشوراع كالمجانين يكسرون كل ما يخص غيرهم من الطوائف ,علما ان الدولة\ النظام حينها اغلقت المدينة لمنع رد الفعل الذي كان ليترجم بحرب طائفية خرجو يومها ايضا ينادون بفك الحصار و يلقون باللوم على الدولة….عملت الدولة على مدى اسبوع بعدها على تهدئة النفوس و دفع التعويض للاهالي!! !و خرجو في الجمعة التالية بالاكفان! ينادون بفك الحصار و يلقون باللوم على الدولة..
و حتى حينما قتل اهالي قرية البيضة مجتمعين الشهيد “نضال جنود” بسبب انتمائه الطائفي بناء على دعوات الجهاد على المنابر لم يشجب مثقفو و حقوقيو الثورة اي شئ سوى فيديو عناصر الامن و هي تجمع اهالي البيضة المسالمين لا بل خرجت هتافات الثورة حينها تنادي باسم البيضة و بانياس و درعا و القاء اللوم على الدولة و شجب وحشيتها!! حوادث القتل الطائفي المتفرقة في تلبيسة و تلكلخ-عاصمة مهربي سوريا- حيث الدعم المستقبلي\الحريري كان حاضرا و كبار المهربين يصفون الدولة بالطائفية حينما تقطع عملهم !! !و كانت عائلات المهربين المسالمين الذاهبة الى لبنان تخرج على الفضائيات و تقول ان الدولة تهاجم المدن من طوائف محددة!! !و اذكر احداهن كانت تصف كيف يدخل الجيش و يقتل الشيخ في سريره!! القو باللوم على الدولة لسماحها بالتهريب فهؤلاء فقراء و الا لما هربو و هم يمتلكون اكثر ثرواتهم من مازوت الدولة!!! حماة التى خرجو كما العادة باراقامهم عن الضحايا فيها و تغاضو عن الهجوم على دوائر الدولة و ذبح شاب يعمل كنادل في احدى مطاعم “الحاضر” بسبب انتمائه الطائفي و شنق اخر على عمود الكهرباء وسط الجماهيرالسلمية القوا بالائمة على الدولة! !و عنفها!! في جسر الشغور بعد مقتل 120 عنصر امني القو بالائمة على الدولة التي تسمح لمثل هؤلاء المسلحين بالانتشار ! !لا بل خرج احد منظري سميراميس ليقول و ما ادرانا ان من يقتل في جسر الشغور هم من المعارضين قد تكون فرقة اسرائيلية هناك! !و الدولة تتحمل المسؤولية !! و تبرع تركيا بخطاب طائفي مبطن باستقبال اهالي المسلحين من جسر الشغور و اظهارهم عالفضائيات و هم يصفون الهجوم الطائفي عليهم!! !و تبرعات جمعيات الخليج العربي لاهل الاسلام في مخيمات الاجئين التركية! شجبهم الخجول و المتراخي لخطب العرعور و الصفا بتصغيره هو و تأثيره! مباركتهم للفتوى الدينية للقارض عاوي\قرضاوي بالجهاد على الحكم في سوريا !!! هؤلاء المكثرين في اللغو يضعون اليوم ما يحدث في هذا البلد من البداية في اطارطائفي محض حيث معارضة من لون طائفي واحد تتعارض مع طوائف اخرى فقط!! و بعض اليساريين المتذاكين الداعيين للركوب على الغوغاء للوصول الى الحكم بلغوهم في الحرية و هم انفسهم من يسخرون من رواد المساجد و الديانات في مجالسهم!!! ان منطق تحميل الدولة مسؤولية الطائفية و انتشارها هي كمنطق تحميل الرب مسؤولية دم هابيل لانه لم يقوي عرق الاخوية الانسانية لدى قاتله قابيل! المسؤولية تتحدد بسن ال18 فحينها يتحمل الانسان مسؤولية افعاله عن وعي و ادراك و نتائج افعاله و اخطائه يستطيع تحملها ذهنيا و جسديا. المسؤولية يتحملها الكبار اما الصغار فعادتهم في الاكثر القاء اللوم على الاخرين و الكبار لكي يقومو بتقويم ما فعله الصغار و ازالة اثار اخطائهم. الدولة لديها تاريخ من الاخطاء و اعترفت بجزء منه …فايز سارة و غيرو… مع احترامي لشهاداتكم و ارائكم و نضالكم : الاعتراف بالخطأ فضيلة. Lieberman deplores Netanyahu for leaning toward apology to Turkey this is from Haaretz news. OK. Noted. We’ll keep track of that and report back any changes. Turkey is an important factor for whirled peas. أفاد مراسل سيريانيوز في محافظة دير الزور اليوم الخميس أن “شارع التربية وشارع التكاية شهدا إغلاق معظم المحلات، فيما بقيت المحال الأخرى المنتشرة في المدينة مفتوحة”, لافتا إلى أن “نسبة الإغلاق وصلت إلى اكثر من النصف من المحال التجارية”. وكانت المعارضة دعت لإضراب عام في المدن السورية اليوم الخميس, حيث لم تشهد المدن الكبرى إضرابا, بينما شهدت محافظة ادلب إضرابا بنسبة 10 %بحسب مراسلنا هناك. وكانت دير الزور شهدت يوم الخميس الماضي أحداثا أمنية أدت إلى سقوط قتيل وإصابة آخرين بجروح أثناء قيام عدد من الأشخاص بقوة السلاح بإرغام أصحاب المحلات التجارية في المدينة على إغلاق محلاتهم. يشار إلى أن مدن سورية عدة تشهد منذ نحو 4 أشهر مظاهرات تتركز أيام الجمعة تنادي بالحرية وشعارات سياسية مناهضة للنظام, تزامنت مع سقوط شهداء مدنيين وعسكريين وعناصر امن, حملت السلطات مسؤولية هذا الأمر لجماعات مسلحة, فيما يتهم نشطاء حقوقيون السلطات باستخدام العنف لإسكات هذه المظاهرات. مشاجرات وصراخ وشتائم بالأمس بين المتظاهرين حول الإضراب المزعوم لمدة 3 أيام إبتداءً من اليوم. سبب الإختلاف هو ممانعة وإستياء أهالي حماة الشرفاء وأصحاب المحلات من تصرفاتهم الحمقاء التي ستؤول بالمدينة الى الهلاك و الجوع و الأمراض و الأوبئة. 1- سد الطرقات وحرق الإطارات لإظهار المدينة بحالة فوضى وثورة عارمة. 2- إجبار الموظفين القادمين من الريف ومن خارج حماه للعودة بأدراجهم.. والرجوع لبيوتهم.. ومن ثم تعطيل الدوائر الحكومية والمؤسسات. 3- إجبار أصحاب المحلات على إغلاق أبوابهم بالإكراه وتحت تهديد السلاح. بيئة خصبة للتصوير وإظهار صورة المدينة بحالة عصيان مدني شامل لتعرضها قنوات الفتنة.. من ثم يستخدمها المتربصون للضغط على سوريا. إذاً فهذه الحالة مدروسة و مخطط لها و مدفوع عليها أموالاً طائلة لتحريك خيوط المؤامرة انطلاقآ من حماة وعن طريق مراهقين وشباب مغرر بهم سواءً بالمال أو بالأفكار المسمومة. I was wondering, in fact. When I saw a vid from Homs, that reminded me of 2003 Baghdad. Hope you are safe and well !! كشفت مصادر مقربة من جماعة “الأخوان المسلمين” السورية في لندن أن القناة السورية الإسلامية المعارضة ، التي بدأت بثها التجريبي من لندن يوم الجمعة الماضي تحت اسم “سوريا الشعب” ، ممولة بالكامل من السعودية و ” رابطة العلماء المسلمين ” التي تتخذ من السعودية مقرا لها ، والتي تشكل واجهة دينية لتيار الأمير بندر بن سلطان . وكان أعلن عن انطلاقة القناة على هامش مؤتمر الرابطة الذي عقد في استانبول الأسبوع الماضي ” لنصرة الشعب السوري” ، والذي شارك فيه نخبة من أئمة الفقه التكفيري في العالم الإسلامي والمحرضين على الفتن المذهبية السنية ـ الشيعية في العالم الإسلامي. القناة زعمت أنها قناة “وطنية الانتماء والولاء، والمبتدأ والمنتهى، بعيدة عن الدعوات الطائفية والعنصرية والفساد والاستبداد، وسطية الطرح والمعالجة، تستهدف الشعب السوري بكل مكوناته في خطابه، تنشد الحرية والديمقراطية وكرامة الإنسان، تتطلع إلى الغد الأفضل والمستقبل المنشود، سلاحها الكلمة الصادقة البناءة، والخبر الثابت الصحيح، والرأي العلمي الناضج”! لكن ، ولأنه ما من أحد يستطيع الخروج من جلده أو الاختباء وراء إصبعه ، كشفت القناة عن وجهها الطائفي والمذهبي القميء منذ ساعات بثها الأولى ، حيث ” أخذ ضيوفها راحتهم” في تكفير هذا وزندقة ذاك ! وكان من اللافت أن جميع ضيوفها الذين استقبلتهم حتى الآن ليبثوا سمومهم هم من الطائفيين التكفيريين ، من قبيل الشيخ معاذ حوى الذي تجنبت القناة ذكر اسمه الثلاثي لئلا يجري الربط بينه وبين والده سعيد حوى الذي كان مراقبا عاما للإخوان المسلمين خلال الفترة 1979 ـ 1982 ، وومن العام 1985 إلى 1987 ، والأب الروحي والعسكري لجرائم الاغتيالات والتفجير التي نفذتها “الطليعة الإسلامية المقاتلة” في سوريا خلال صراع الإخوان المسلمين مع السلطة. ومن المعلوم أن سعيد هو هو من قاد الحركة الاحتجاجية في حماة العام 1973 للمطالبة بـ”إسلامية سوريا ودستورها”. أما النموذج الثاني الذي استقبلته القناة فهو الشيخ السوري التكفيري محمد بن سليمان العبدة ، الذي تميز بنظريته عن ضرورة ركوب الثورات العربية للحيلولة دون سقوطها في أيدي العلمانيين! ويبدو أن القناة أسست لإنجاز هذا الهدف في سوريا على غرار ما حصل في مصر! الطريف في الأمر أن القناة استقبلت شخصا باسم وليد صبحي السقا ، وقدمته ( حسب صحيفة “الشرق الأوسط”) باسم ” قائد لواء المدرعات في سوريا سابقا” ، كما لو أنه لا يوجد سوى لواء مدرعات واحد في سوريا وليس أكثر من خمسين لواء! الأكثر طرافة ، وهو يدخل في باب ” التجليط ” ، على طريقة إقدام “العنين” على لف عضوه التناسلي بخرقة في ليلة عرسه لإيهام عروسه بفحولته ، أن القناة قالت إنه “رائد ” سابق في الجيش السوري! فهل سمعتم بوجود رائد يقود لواء مدرعات إلا في .. بوركينافاسو حيث يقود الانقلابات ضباط برتبة ملازم أول ، وليس في سوريا التي يحمل أصغر قائد لواء فيها رتبة عميد ، وأصغر قائد سرية صغيرة ( مكونة من ثلاث دبابات) برتبة رائد! ربما كانت القناة تقصد القول إنه كان قائد لواء مدرعات في الحقبة العثمانية أو .. العصر المملوكي! You’re a sick little dreamer, Mr Pres, with respect to your scenario as outlined in post number 111 above. The fact is, Bashar is an embarrassment and what is worse, an incompetent embarrassment. He is not, in any way imaginable, the choice of the majority. At best, Syrians feel they’re stuck with him because no one else (as yet) has been recognized to fill the bill. In time, however, someone will step forward. You did, however, validate one point I have brought up repeatedly. That is, the role of the Syrian Army. A true national army would never agree to kill citizens. The fact that the Syrian Army has done so repeatedly is proof that the Assad Mafia regards the Army as an instrument of its power. The Army, therefore, is not to be trusted. And after Bashar is dead and gone, the Senior Army Officers should be put on trial for their lives.